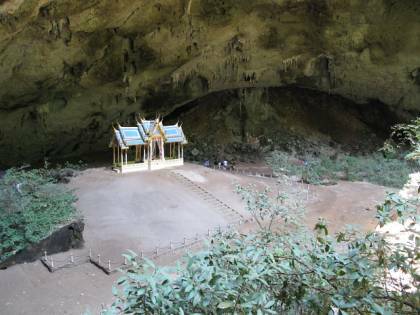 Tham Phraya Nakhon Cave takes some getting to but it’s well worth the hike. Reports say that this is the most photographed cave in Thailand, I have seen some great photos of Tham Phraya Nakhon Cave on the internet, and it’s easy to understand why it is so popular with photographers. 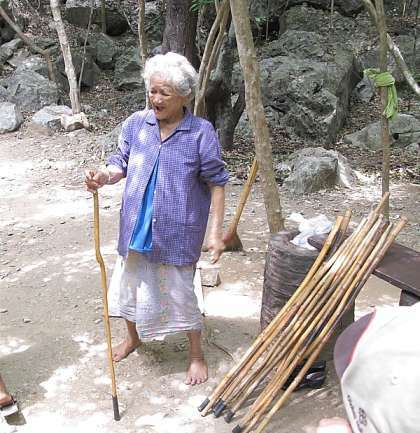 A lady hiring out walking sticks at Phraya Nakhon Cave, a sign of things to come. 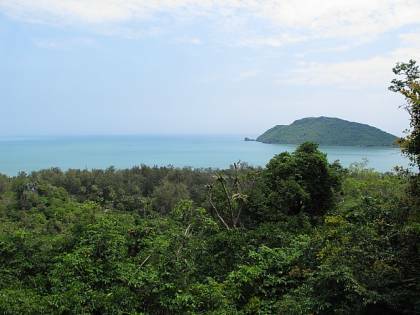 After taking the Long-tail Boat or walking the hillside trek from Bang Pu Village to Laem Sala Beach, follow the signs to Phraya Nakhon Cave. A short walk will take you to the bottom of a steep rocky hill, climb the hill for about 30 minutes to reach the entrance to Phraya Nakhon Cave, you can hire a walking stick from the old lady at the bottom, costs about 20 Baht. 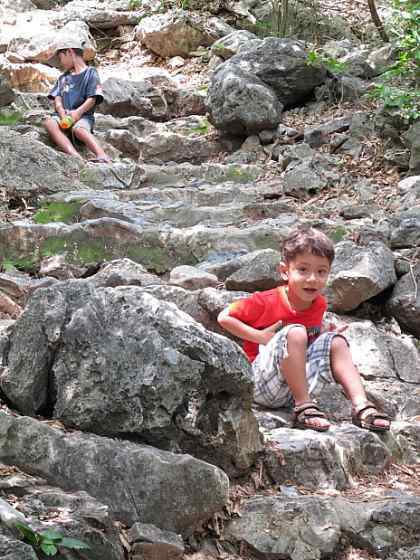 It’s a steep climb but the Boys made it, just take your time. The trek up the hill to Phraya Nakhon Cave is steep and rocky, be careful if you have young children with you, and wear sensible footwear, sandals with a back strap or preferably training shoes. Be sure to wear some mosquito repellent or you will more than like suffer a few mosquito bites, the trek is dense with vegetation and the mosquitoes are aggressive. A beautiful view from the halfway point to Phraya Nakhon Cave. Half way up the climb to Phraya Nakhon Cave there is a resting point, you can usually buy water and cold towel wipes here, but it’s a good idea to take plenty of water with you just in case. Beautiful view of the sea from here as well. Once inside Phraya Nakhon Cave your efforts are rewarded by the beauty of the place. On arrival at Phraya Nakhon Cave, follow the track down in to the entrance chamber, here you will see an information map pointing you to the main features of the cave, the main chamber is to the left when you arrive at the bottom. The main chamber is best described as a “huge cavern” with 2 holes in the ceiling. The main chamber of Tham Phraya Nakhon Cave. To give you some idea of the size of this chamber, take a look at the above photo, to the right of the Sala you can see a group of Human figures. Holes in the ceiling of Phraya Nakhon Cave. 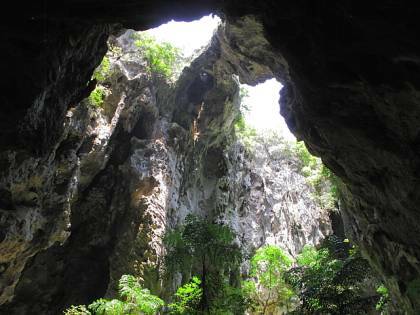 The photo (above) shows the holes in the ceiling of Phraya Nakhon Cave, beneath these holes there are trees and vegetation growing due to sunlight and rain entering the cave. If you visit the cave at the right time you will see the sunlight steaming through the holes and bathing the Sala with light. The “Sala” at Phraya Nakhon Cave. The cave was named after a former provincial ruler “Phraya Nakhon” who discovered the cave in the early 1800’s after his boat was forced ashore during a storm at sea. 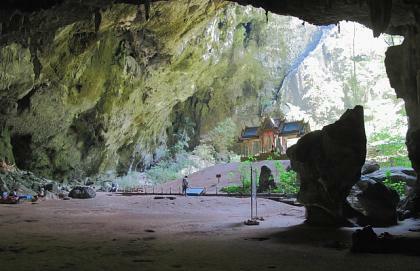 The main attraction of Phraya Nakhon Cave is the pavilion, or “Sala” which you see in the photo above. The Sala was built for the first visit of king Rama 5 in the year 1890. The signatures of two former Kings of Thailand. The cave has been visited by 3 Kings of Thailand, the first was the much revered former King of Thailand, King Rama 5 in 1890, the second was Rama 7. King Bhumibol (Rama IV) has made 2 visits to Phraya Nakhon Cave. 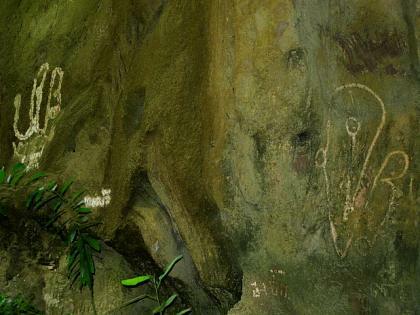 The signatures of Rama 5 and Rama 7 can be seen inscribed in the wall of the main chamber, (see photo above). 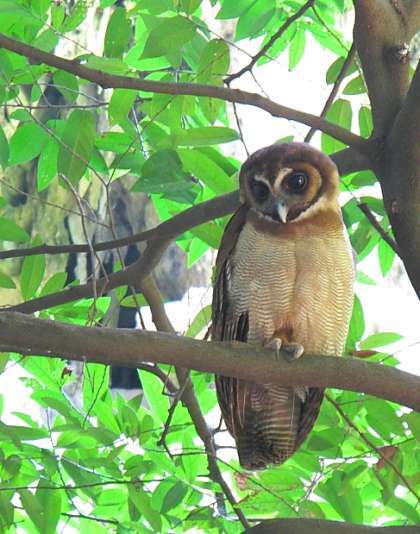 Seeing this Owl was an added bonus. Two pleasant surprises on our visit Phraya Nakhon Cave was first, seeing a Monitor lizard on our way to the cave, and the Owl (pictured above) on our way back out. Phraya Nakhon Cave is situated inside Sam Roi Yot National Park, Prachuap Khiri Khan Province, on the western side of the Gulf of Thailand. 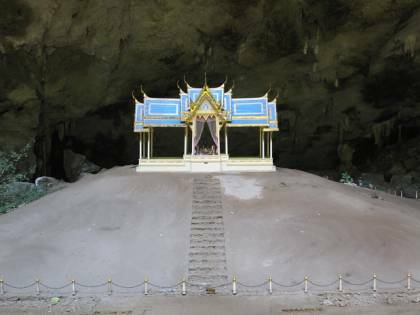 The best time to view and take photos of Tham Phraya Nakhon Cave is said to be in the month of January at 10.30AM.